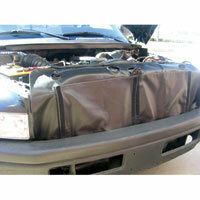 Improve engine warm-up time in cold weather with a Covercraft winter grille cover for your '94-'02 Dodge Ram truck. 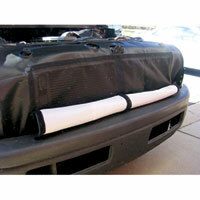 In Summer the cover is rolled up and acts as a bug screen to help keep the radiator free-flowing for better cooling. 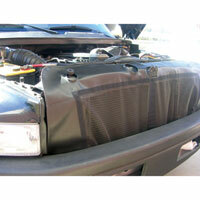 The grille cover is made of black vinyl and goes over the front core support. The material rolls up and down so you can adjust the amount of air you want to pass through the radiator. The grill cover is great quality and fits well. It covers the radiator and coolers and slides down behind the bumper. It also has metal clips on the top that help keep it in place, although I haven't found where those clip to. The adjusting covers have nice velcro and are easily adjustable. I'm satisfied. "Beyond fantastic! Ordered a cabin air filter kit for my 2016 Ram. Was emailed that the item was back ordered but still got it within two days after that. They hooked it up... glasses, stickers, calendars, flyers, detailed instructions AND warranty and return paperwork. I'm absolutely thrilled!"